It will be dirt, mud, heat and intensity. It will be hard fought and it will be unmerciful. The strongest will win and the victor will be glorified. 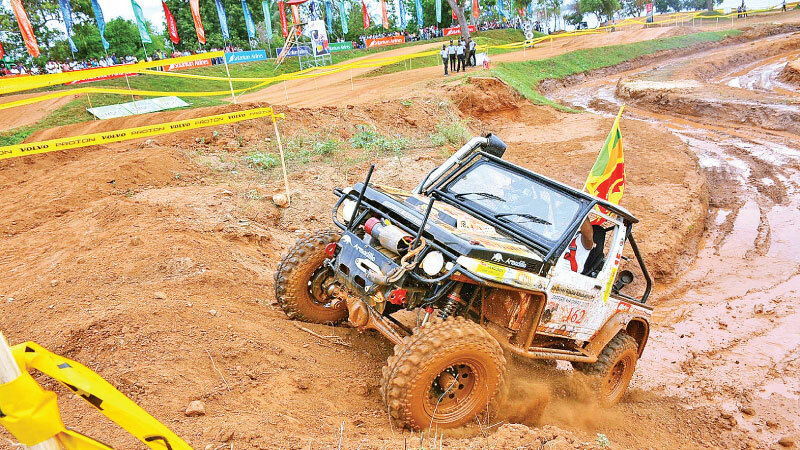 This is the sappers 4x4 Gympo off Road Motor Sports rally started in 2011 by The Sri Lanka Army Corps of Engineers in association with the Sri Lanka Four Wheel Drive Club (FWDC). In 2018 this event will conducted for the eighth successive year by the Sri Lanka School of Military Engineering (SLSME), Tunkama, Embilipitiya. The Logo of this motor sport is depicted with the words “Sappers 4x4” with a black and white checked flag to indicate the off road motor rally. The Bison with wheels symbolizes the rugged and tough nature of the competition that competitors will compete for, with the word “Gympo” - the unique name given to this Bison. Daily News spoke to member of the publicity committee, Lieutenant Kushan Kathriarachchi of the Sri Lanka Army, on this intense and enjoyable event that brings out the best in a competitor. “The track has been specially designed to create a motor sport event that is competitive, enjoyable and makes it a thrilling experience for everyone involved. The terrain will really challenge the competitors and make them battle intensely in order to emerge triumphant. It will be wondrous to watch and the atmosphere will be electrifying. 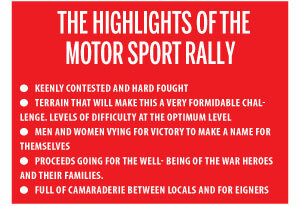 It will be motor sport at its best,” said Kathriarachchi. The track is situated in the premises of the Sri Lanka School of Military Engineering which is the training school of the Sri Lankan Engineers regiment. “The competition is open to non- army personnel which will create a very interesting exchange with the non- army personnel doing their best to outdo the soldiers in what promises to be a keenly contested event. The rules and regulations have been outlined by the 4wheel drivers club and the Sri Lanka Motorcycle Riders Association,” stated Kathriarachchi. It is not just the locals who are aboard! There will be four foreign teams for this 4x4 event making this something rare and not to be missed. Seeing events like this is certainly a refreshing experience. The event will be full of blood, sweat and tears and victory will be sweet. There promises to be great camaraderie between locals and foreigners. They will be brothers on the field. The idea is to play hard but play fair. “There will be sunny atmosphere and this will be the ideal opportunity to bring the family and enjoy an afternoon of motor racing. There will 30 local teams and 120 local riders. There will be no age limit. The young will compete against the old and the day will be decided by hard work, talent and luck,” explained Kathriarachchi. The competition will be not only for males but there will be female lionesses taking part as well. It is not only males who are interested, there is also a huge following amongst the women. When it comes to dirt, mud and the heat, women are equal opportunists. “The main sponsors are Senok Trade combine pvt ltd, Avonsmart engineering pvt ltd and CEAT. The Food and Beverages will be from Elephant House. The printed media sponsor are Lake House and Dinamina. Media Sponsorship is from Rupavahini and Channel EYE. The Design Partner is Essence BTC,” pointed out Kathriarachchi. “There will also be cash prizes given out and there will be a capacity for a 15,000 crowd. The ambience promises to be great. We invite everyone to come over and just enjoy the day. It will be held on September 2. This is the eighth year with seven competitions held previously. The war was won by soldiers who laid their lives down for their country. They left their families to fight for us and our freedom. We live the way we live now because of their selfless sacrifice. We must never forget them. They fought in a cruel war, some of them losing their limbs. “Conferring to the Vision of the Sappers 4x4 Gympo 2018, the funds raised from this event will exclusively be used to develop the infrastructure of the Sri Lanka Army Corps of Engineers and for the wellbeing of the war heroes and their families,” added Kathriarachchi.